Lowe & Fletcher nozzle lock for wooden furniture. 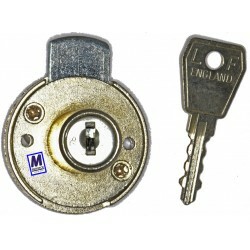 Keys: 2 supplied, double entry. Nozzle size: 16.3mm diameter x 19.5mm. Body size: 38mm diameter x 7mm.  L&F nozzle locks are typicaly posted the same day/next working day.